I went to the Lorraine Motel where MLK was murdered for the third time today and was amazed to see that a woman who was protesting a proposed civil rights museum on the site back in 1989 was still there with her protest signs. She apparently thinks it memorializes the murderer. I disagree. I was as impressed today as I was during my second visit to the site (when it was a museum) about 9 years ago with Noah. It does a powerful job of laying out what led to the Civil Rights Movement and eventually MLK’s murder, with a dramatic finale: the (now glass-enclosed) motel room where MLK was shot on the balcony.It was poignant to visit this place now, with so much racial unrest. Still. Tonight we are staying in another really cool Airbnb in the woods south of Oxford,MS. It’s on the ground floor of a house in a rural area with an unlikely contemporary art gallery (the Tree House Gallery) on the edge of a two lane winding country road. We have our own apartment with not one boring piece of furniture, artwork or rug. Shabby chic, interesting art everywhere, antiques, rugs from foreign lands. It’s a treat. And there is a huge screened in porch above us that I hope to linger on tomorrow morning. Not surprisingly, my stomach is rebelling from all the rich food we have been eating. We tried another BBQ place recommended by locals (Memphis BBQ in Horn Lake, MS) but didn’t like it as much as Central BBQ – atmosphere was too fast foody. In Oxford, we stopped to browse in the charming and very Southern square at the famous Square Books and had a beer on the second floor balcony of The City Grocery, a beloved second story old bar overlooking the square (which reminds us a bit of Franklin, TN) and ate rich food at Snackbar nearby (fried oysters in a creamy sauce for me and dirck and I split “Vietnamese coffee ice cream” which had thru-the-roof butterfat content. My stomach is starting bubble up again just thinking about it. )Locals were raving about new places — Saint Leo’s (for pizza) off Oxford’s Square and Grit in the tiny town of Taylor (famous for the Taylor Grocery, a southern restaurant in a building that barely looked open anymore (part of the charm, apparently). Sadly, it wasn’t open on a Monday. central BBQ, Rum Boogie Cafe, Otherlands Cafe, Rev. Green’s Church, FourWay, Sun Studio, Southern Folklore center – Memphis! Loving this town. This morning we spent over two hours in church, much of it listening to fantastic gospel music by not only Al Green (aka Rev. Green) but an assortment of church members, all with fantastic voices! The church, on a remote exurban road, was full of visitors from Brazil, Germany, Australia and Iowa….we bumped into a friend sitting in the pews who is from Des Moines. Affter church, we went with two friends we met for the first time last night at Rum Boogie Cafe, a fun juke joint on Beale Street, to Four Way, the famous soul food restaurant for lunch. Turns out the rest of the after church crowd was there so the place was packed. But it was worth the wait. Great people watching, especially the church women dressed so elegantly, with fabulous hats worthy of Ascot. The last time I saw such great hats was at Charles and Di’s wedding in 1981. The food was delicious too — fried chicken, with two sides (excellent cornmeal dressing). We sat next to a table of churchgoers who were really friendly and we enjoyed talking with them while our chicken was being fried (which took awhile). After Four Way, we took a totally entertaining tour of Sun Studio— our guide was a lot of fun and the tour reminded me a bit of touring the Motown headquarters in Detroit. Then to the Southern Folklore Center, which happened to share space with a Jewish museum. The center’s co-founder, an outgoing filmmaker named Judy, gave us a guided tour of the center and pointed out several of her relatives in the historic photos of Jews in Memphis decades ago. Who knew? (Apparently Jews own the famous Peabody Hotel…) Also thoroughly enjoyed a light breakfast at Otherlands Cafe in our neighborhood, with mismatched tables and local art including a folk artist named Karen Capps who it turns out lives a block from where we are staying. We went back to Beale Street tonight (Freeworld, 30-year -old cover band, at Blues City Cafe where we sat with a nice couple from Denmark. Swedes were at the table next to us.) At one point, a guest artist – an older woman – got on stage and played a mean harmonica and sang. Who knew? Beale Street was more fun than I expected. I was worried it would be full of drunks like New Orleans’ Bourbon Street …but we got there relatively early, which may have helped. And the music was great. On Saturday night, we wandered into Rum Boogie and encountered, as one guy put it “a smoking hot band” (Vince Johnson and the Plantation Allstars) followed by a slightly less smoking one but when I walked to the bathroom, I stumbled across another great band in the next room and a dancing crowd. Just nice to see people having a good time. Some of the best music was on the street with various bands playing and at one point on a surprisingly warm night (it was 91 degrees at one point) I found myself line dancing in the street with a bunch of strangers. Why not?! This comes courtesy of my friend Kathy who is on a road trip with her family from Des Moines to Houston via some of my favorite places, including most recently, Memphis. Before they left, Kathy’s family got some road food recommendations from a well-known BBQer in Des Moines who owns Woody’s. Here’s the first restaurant they tried in Memphis’ Germantown area. Can’t go wrong with a place that offers complimentary deviled eggs!! The Germantown Commissary, 2290 S. Germantown Road in the Germantown area of Memphis. According to the menu, a commissary is another term for a Southern general store. Interesting decor, with twinkle lights, and bleached animal skulls, movie posters and old tin signs on the wood-paneled walls. Great dry-rub ribs and tamales smothered in chili and cheese. Excellent coleslaw. Almost every dish comes with a deviled egg. Homemade lemonade and sweet tea. We didn’t have room for dessert, but they looked great: tall layer cakes and cream pies. Word from my stepdaughter E that she visited Rev. Al Green’s church, the Full Gospel Tabernacle in Memphis, last Sunday morning – and the Reverend (the famous soul-singer/pastor) was in! Which means that the music his church congregants perform each Sunday was all the more fantastic. My son and I visited the church almost two years ago and had a great time, listening to one terrific gospel singer and musician after another, but Rev. Al was away on tour, promoting his latest album. In addition to the sunday morning service, there’s a Thursday night choir rehearsal open to the public – from what I can gather from the church’s website. Good to know. More on Memphis – for E. and friends who are heading there. With the help of my journal (#50) and the Internet, I jogged my memory on a few specifics, most having to do with food. The BBQ place we went to near Graceland is Marlowe’s – kinda corny commercial decor with smiling pig in a pink limo as its mascot but ribs and service good. On Beale Street, we did in fact eat ribs at The Blues City Cafe. Here’s some of my journal entry from that day to give you a little feel for the place…. re hotel/riverwalk/trolley: “Our hotel is right downtown on a pretty little pocket park and overlooking another park that faces the Mississippi. We walked along the riverfront with pretty parks and a promenade. Memphis has done a nice job of fixing up this area for tourists. Then we took an old wooden trolley along the river and through town, getting off at Beale Street. A great deal for $1 and a great alternative to driving. 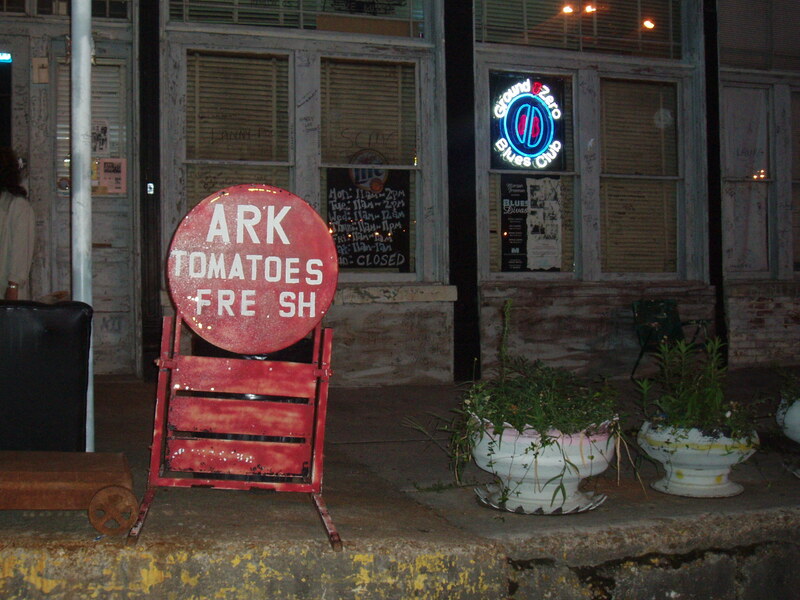 Okay Emmylou, here’s what I’ve got for YOU – recommendations for Memphis based on our 2008 trip there! We stayed at the Sleep Inn at Court Square downtown – good location, clean, pleasant, reasonably priced ($125 for a double in 2008) right near the Mississippi and near the tracks for the funky old Main Street Trolley car that will take you to Beale Street and back for much less than the hassle of driving, parking, and returning possibly inebriated. Walk or jog along the Mississippi Riverwalk. Be sure to walk through the Peabody Hotel – this is the one where the ducks parade through the lavish lobby. We loved the STAX Museum of American Soul Music – complete with Isaac Haye’s real car (which, as I recall, had power blue fake fur upholstery). This rough n’ tumble neighborhood reminded us of the one portrayed in “Hustle and Flow” – the very good movie filmed in Memphis (“It’s hard out here for a pimp” was its Oscar-winning song.) If you haven’t seen, do! There are several music museums in Memphis – this one struck us as the most interesting and authentic, located in the original STAX Record Co. building/neighborhood rather than glitzy downtown. En route to the museum, we stopped for soul food at The Four Way (998 Mississippi Blvd.) an old neighborhood place. Great fried chicken, okra, lemon meringue pie etc. Be careful with the hot sauce. If you happen to be in Memphis on Sunday morning, DO NOT MISS a visit to Rev. Al Green’s church (that would be Gospel Legend Al Green.) He is often there singing – along with many other church members who are great singers and musicians. Alas, when we visited “Al Green’s Full Gospel Tabernacle,” Al was off promoting his latest album but there was a several-piece band – horns, keyboard, drums, etc. – and one person after another got up to give wrenching testimony, some of it inevitably in the form of the most astonishing gospel singing. We were a little shy about entering at first but we were far from the only visitors – there were rows of us, mostly white folk, some from as far away as The Netherlands. Noah had to drag me out of the church after over an hour. I could have stayed all day. Rev. Green’s church is not far from Graceland and if you haven’t been, you should go – it’s overpriced and tacky but truly an American experience. There’s a good BBQ joint across the street called – i can’t remember the name. will look up. all this really makes me want to return to Memphis. takemewithyou! Check out the 2005 NYTimes 36 hours memphis piece and the one last Sunday in NYT travel section on edgy Memphis….I was fine with touristy Memphis….